We are the experts for Spain Rail Tickets to the trade and general public. RailTourGuide are authorised booking agents for Spain Rail Tickets and we sell these tickets from our office based in the UK. For more information on Spain Rail Tickets please contact us. The trains in Spain are very modern, comfortable and offer high speed connections to go from city to city. Most trains have both Second class and First class seating and seat reservations are compulsory on most AVE Intercity and Long Distance services. 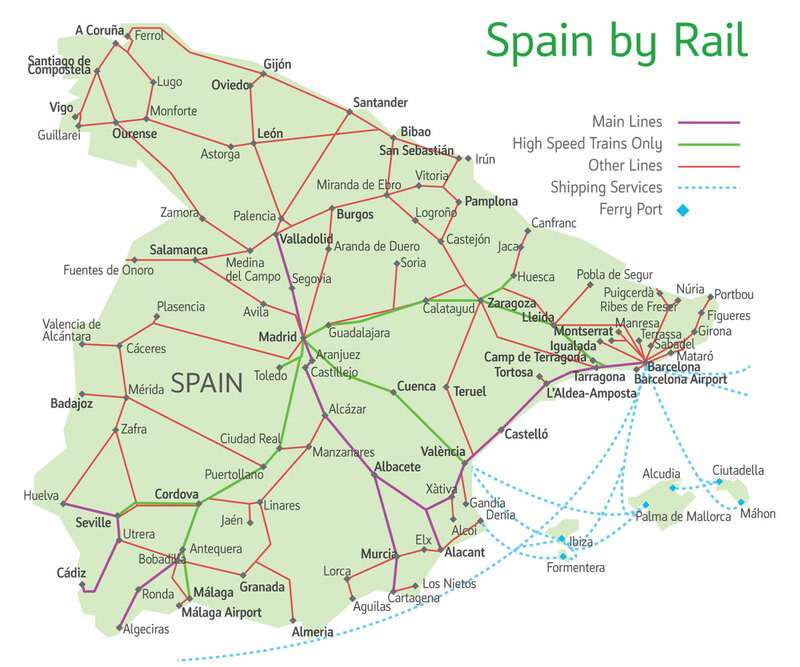 Spainish trains operate between the key cities of Barcelona, Seville and the capital city of Madrid and offer High Speed connections. The TRENHOTEL overnight service operates on the route between Spain and Portugal. The journey between Madrid and Lisbon takes around 10 Hours 40 Minutes and is a comfortable way to travel between these two great cities. Lisbon Santa Apolonia 07:30 the next morning. Club Cabin, with a washbasin (Single) = £185.00 per person. Club Cabin, with a washbasin (Double) = £135.00 per person. Grand Cabin, with a toilet and shower (Single) = £225.00 per person. Grand Cabin, with a toilet and shower (Double) = £165.00 per person. AVE S103 Trains operate between Barcelona and Madrid and vice versa..